Do you remember 45 RPM records? And '45 stackers, like the one pictured here? We used these on my little record player as we roller skated in the basement. I remember the sound of the record dropping, the record player arm moving. I haven't played vinyl in years (alas, I know - my loss! ), but this sound was such a part of my childhood. Did you grow up with 45's? I'd love to hear your memories in the comments, below. Heck, I still listen to them. :-) The benefit of being a former record seller is that former inventory is now a collection. 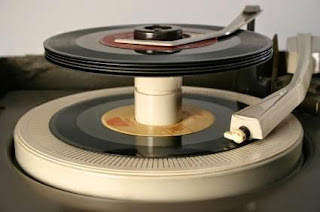 I definitely remember 45s and record stackers. I'm sure my grown sons would get a kick out of a stack of 45s.